What flavor and color the nativity adds to the setting, without even trying! (All this for no additional price, whatsoever) One of most overused (and often misused too) phrases while remaking a movie from another language is "changed to suit the nativity", when what they mean is "changed the LANGUAGE to suit....". Nativity is not mere language, it is the faces, the dialect, the customs, the sights, the way of life, and if among all these, only the language part is addressed, well, the makers could have saved even more by merely dubbing the voices over than attempting at remaking the movie with local faces against a non-local setting. Tamil movies have always retained a strong native flavor, the dresses, the walk and talk, the speech patterns, the reactions, so much that "feels like a dubbing movie" is often used as a put down. From way back when to the current lot, no other filmdom represents its rustic life better than the Tamil lot and a lot of it has to do with the fact that they let the whole atmosphere of the setting permeate the entire movie, than just have the leads sited in the setting while nothing about them rings true to their environment (No better example than Kamal Haasan's classic, 'Virumandi'). Telugu movies, unfortunately, play it safe, either for the fear of lack of broad appeal for native flavor or not enough observational strengths on the part of the filmmakers. 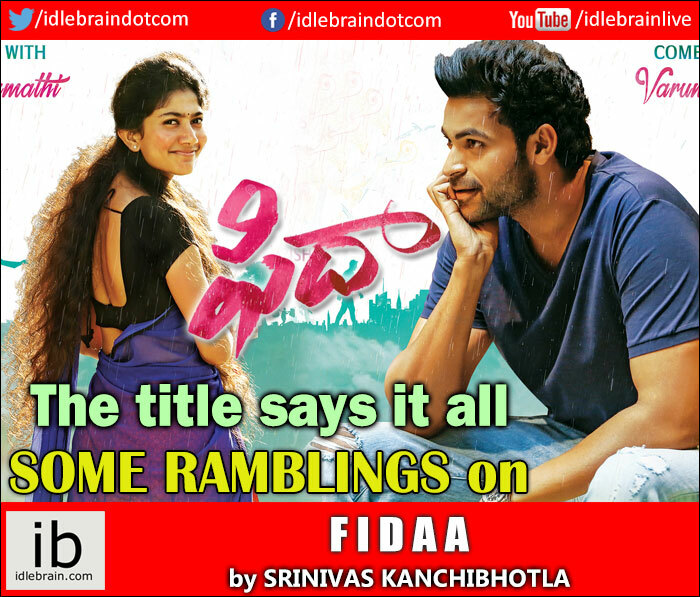 Long after "seetArAmayya gAri manavarAlu", which made the ethos of kOnaseema an integral part of the movie, with a hard shell and a soft core attitude, here is "Fidaa", this time portraying the culture of Telangana in a light never seen before in a telugu movie. The long held stereotypes (which are nothing but short-hands distorted over a period of time) of the different regions and different dialects of the telugu land (gOdAvari - sarcastic, seema - factionist, telangana - comedic, krishna & guntur - the holiest of all) has been shattered with a sledgehammer in "Fidaa", when the characters speak in native dialect without a trace of irony (or a wink at the end). This is not about glorification or even shining a light on an ignored aspect of a culture till date, where people have dreams and aspirations, hopes about the futures, go about their lives just as the rest of the lot in the movie universe, except they speak in their native tongue without having to dumb it down for universal appeal. The producer and the director deserve all the applause for sticking to their vision of portraying the lives of the people in the manner they usually go about in their day to days. It is immaterial at this stage whether the movie is any good or not, but this certainly is one brave step that would herald a sea change in the way makers are going to think about and come up with stories that emanate and resonate from the deep burrows of the land. That said, such a seismic shift in the thinking regarding the setting is backed up with equally strong writing, where it appears that the choice of the setting is not a mere gimmick (for any financial reasons), where the difference in the cultures is not played up to create the mandatory conflict, where, and this is important, the story even transcends the setting. That is a very fine balance that Kammula has struck and came up with all trumps. "Fidaa" is certainly his strongest work till date. Often accused (and rightly so) for portraying the language in a mediocre light, filling up with "actors" who appear to have little comprehension about the language, leave alone, the nuances of it, Kammula seems to have certainly made amends for all his previous foibles and filled up "Fidaa" with non-actors (at least a majority of them, and great casting at that) who speak in nothing but chaste dialect (which is a welcome relief, not just in this one, but in the current telugu movie milieu). More so than the language, there is certainly a lot of maturity in his writing, knowing where the joke is and where to end it (in the first half, "chemaTalu paTTae ammaayilu meekenduku kanipistAr bAbu", what a beautiful observation!!) and not overplaying the emotion (of conflict, in the second half). With no real story to boot, the strength of his screenplay comes to fore, as he fills it up with moments that are endearing, heart warming ("wow! chaalaa baavundi! ", the hero appreciating the scenery down below from atop a hill, and the heroine simply replies "maa vooru! "; none else needed to be added) and heart tugging (the point of the dad taking the medicine on his own played to little melodrama). The colorful first half is finely balanced by a more personal second half, where majority of the action happens between the same two characters. Not since Gautam Menon's "yeTO veLLipOyindi manasu" (a much braver effort) has anyone attempted this mining of the relationship based only on personalities (and not on any other external conflict points), and Kammula rises up to the task. That he doesn't call to the aid any filler scenes, nor any unnecessary comedy, is a mark of the confidence of the maker on the strength of his material and of his conviction. Telugu movie which is definitely dialogue-heavy, be it for comedic or emotional purposes, has found a new direction here, where the witty one-liners work, not because of lines themselves but because of the way they are setup for, and the emotional ones resonate, with little to no words altogether. Hopefully "Fidaa" is a new direction for Kammula (like how "eega" was for Rajamouli) to churn out more intimate and personal stories whose voices are often ignored/drowned out amid the din of the big fares. "Fidaa" would not have been possible without Sai Pallavi. A non-native nascent actor, she takes the script by the cuff and never lets go of it till the end. Everything about her performance, her diction, dubbing, emoting and reacting are just pitch-perfect and she could not have asked for a better role that goes through the entire gamut of emotions before the final credits roll. More than in "Premam", where she had a more subdued character, "Fidaa" has her turning the dial all the way to the right, and yet be firmly within the limits. Roles as these, boisterous and fun, come with an built-in trap for over-action, -exuberance, -emotion, and yet Sai Pallavi manages to side step them all, thanks in large parts to the way the role is written (Compare it to the near unbearable cuteness of Genelia in "Bommarillu"). Her face, a kaleidoscope of expressions, registers every single emotion with all the intensity and utmost sincerety, making the effort appear near natural. And not enough words about her dubbing, where she nails each and every nuance, enunciation and stress as a well-trained seasoned actor. Debuts do not come packaged in such greatly written roles, and probably, after Saritha, from way back when in "Maro Charitra", Sai Pallavi notches up an allround performance in "Fidaa". After viewing B.N.Reddy's flawless "Malleeswari", when asked if he could find anything amiss with the feature, Sarvepalli Radhakrishnan pointed to the fact that the horses gallup kicks up some dust on a day that was supposed to be raining heavily. Likewise, in "Fidaa", post breakup, when Bhanumathi is handed down the wedding ablum of her sister, she quickly goes in and plucks out the photographs containing her and the hero and hides them. Physical photographs in wedding albums in this day and age? :-).